When it was first announced that Tom Hardy would be playing Bane in Christopher Nolan's final Batman film, The Dark Knight Rises, Bat-fans around the world breathed a collective sigh of relief. If anyone could do justice to the man who broke Batman's back, surely it would be the 33-year-old British bruiser, who rose to fame on the strength of his domineering performance in Bronson. Still, there have been some questions about Hardy's appearance in the film. Would he be as impossibly muscular as his comic book counterpart? How would his venom-pumping mask and suit look in the gritty, more realistic tone of Christopher Nolan's Batman universe? Thanks to an eagle-eyed set visitor, at least some of these questions can now be answered. To date, all we've been able to see of Bane are a couple of interesting looking publicity stills (like the image at the top of this article) and an extremely brief glimpse in the recently-released Dark Knight Rises teaser trailer, so it's been hard to get a good sense of what the character will end up looking like in the movie. However, a new series of photos from the Pittsburgh set of The Dark Knight Rises reveal Tom Hardy as Bane in full costume. The images, which come our way via Just Jared, don't offer the best detail, but definitely give us a good idea of Bane's appearance in Nolan's final Batman film. Before we dig into an analysis of Bane's costume, it's important to remember one important thing: these are set pics - which means that they don't really reflect what Hardy will look like in the finished product. That being said, there are things to like and dislike about Bane's look. In the comics, Bane wears what is essentially a wrestling outfit, complete with a Mexican luchador mask. Obviously, that type of costume wouldn't fly in the realistic world of Nolan's Batman films, so it's interesting to see the alternative they've chosen. Judging by these pictures, it looks like Nolan and his team have decided to go with a more militaristic look for Bane, including a Bomber jacket style coat and body armor. On its own, the costume works and reflects an interpretation of Bane as a militaristic character. However, the somewhat conventional costume does provide a stark contrast to Bane's mask, which seems out of place. Of course, we still don't know how the venom-system works, so there could be a lot more functionality to the costume that we're just not seeing yet. My guess is that there's something interesting going on behind that upturned coat collar (like Bane's venom delivery system). When we see Bane briefly in the teaser trailer, he's hulking toward a disoriented Batman...and he's not wearing this coat - which suggests that when Bane bulks up on venom, he loses the coat to reveal his massive frame (an obvious statement, I know). One possibility is that Batman wrecks his black Tumbler in some way, and needs to use a quick replacement. It's boring, but it works. There's also one more (highly speculative) possibility, however. Maybe Miranda Tate, Marion Cotillard's character (who many suspect to be Talia al Ghul), uses Wayne Enterprises resources to give a Tumbler to Bane! This theory is nothing but wild speculation. That said, imagine if Tate (secretly Talia al Ghul) used her position as a board member of Wayne Enterprises to supply her father's chosen assassin (Bane, freed from prison) with the tools to defeat Batman. Doesn't that sound plausible? 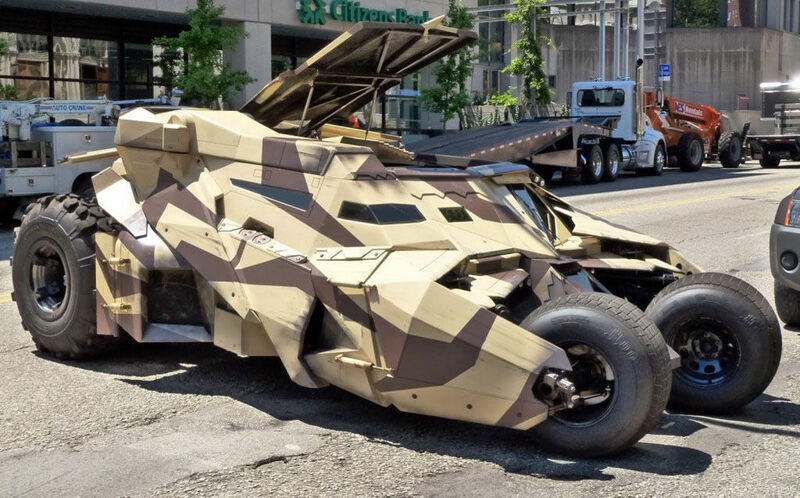 Anyway, feel free to debate Bane's costume, the camo Tumbler, and our zany theories in our comments. We'd love to know what you think. Update: Replaced images with more recent, HD shots.